ACNEVIR is specially designed for adult skin. The triple-action formula promptly reduces pimples and blackheads, diminishes redness, and keeps pimples from coming back — without the drying effects of benzoyl peroxide. ACNEVIR Gel is specially designed to treat Adult Acne with THREE active ingredients, compared to just one in other brands. Our formula is alcohol-free, non-oily, and non-comedogenic and helps keep your skin pimple-free every day. The clear, water-based gel absorbs quickly to provide a flawless finish under makeup and won’t slow you down in the morning. It has no benzoyl peroxide that can dry out your skin and bleach your clothes or pillowcases. Plus, it has no tint so it works well on all skin tones. Find out how ACNEVIR can make a difference for you with its tailored formula, designed specifically for sensitive adult skin. What are the directions for ACNEVIR Gel? Cleanse skin thoroughly before applying medication. Cover the entire affected area with a thin layer of ACNEVIR Gel one to three times daily. Massage gently until absorbed into skin. If you are a new user of ACNEVIR Gel, we recommend applying sparingly to one or two small affected areas during the first three days. If no discomfort occurs, you may continue use. Because excessive drying of the skin may occur, start with one application daily, then gradually increase to two or three times daily if needed or as directed by a doctor. What are the active ingredients in ACNEVIR Gel? ACNEVIR Gel contains Resorcinol 2x, Salicylic Acid 3x and Sulphur 1x. Is ACNEVIR Gel approved by the FDA? ACNEVIR Gel is a homeopathic product and homeopathic products are permitted by FDA regulations. Why does the carton say “specially designed for more sensitive adult skin”, while the directions say “those with sensitive or allergic skin should consult a doctor prior to use”? 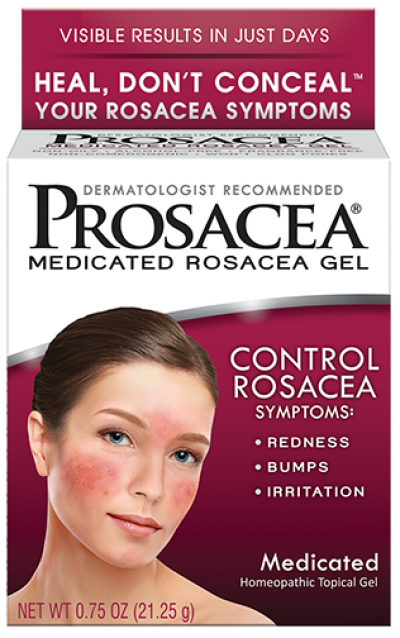 Many OTC acne medications are made for teenagers with oily skin. These medications contain ingredients such as benzoyl peroxide and alcohol, which can be very drying and hard on adult skin. ACNEVIR Gel is water based and contains aloe, so it’s formulated to be much gentler on more sensitive, adult skin. Some adults, however, are sensitive to many topical medications. 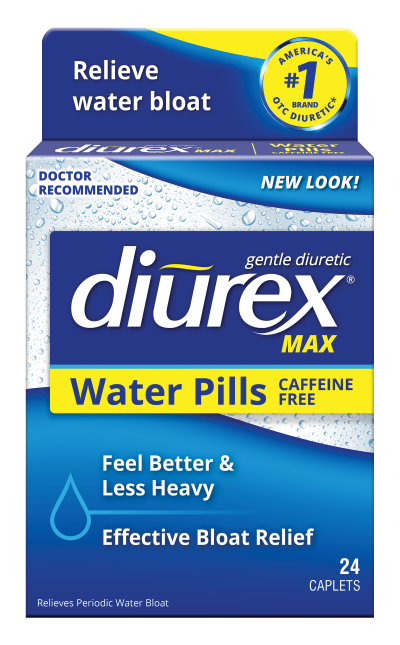 For those individuals we recommend speaking with a doctor before use. Can I use make-up, moisturizers, or sunscreen with ACNEVIR Gel? Yes, you can use make-up, moisturizers or sunscreen with ACNEVIR Gel. However, we recommend that you wait approximately 15-20 minutes after applying ACNEVIR Gel to let it dry and absorb into the skin before applying any such products. We also recommend you consult a doctor or dermatologist about questions and/or recommendations on the appropriate cosmetics, moisturizers and sunscreens which may be used along with ACNEVIR Gel. 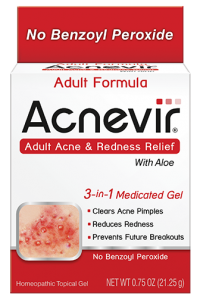 What is the expiration date for ACNEVIR Gel? Because ACNEVIR Gel is a homeopathic product, it is not required to carry an expiration date. However, we do monitor the physical integrity of the product for three years following the date of manufacture. If you would like to contact us and provide us with the lot number, we can tell you when the lot was manufactured. Your skincare regimen should be different too. Facial breakouts can often continue to plague men and women well into their 30s, 40s, and even 50s. Dermatologists call acne that does not clear by one’s mid-20s “persistent acne”. More frequently seen in women, persistent acne can cause tender, deep-seated, inflamed pimples and nodules around the mouth, chin, and jawline that can be difficult to treat. Acne can also suddenly recur in adults after years of clear skin. Late-onset acne is more frequently seen in women and can often recur around menopause. Hormones are primarily to blame for this acne that can form on the chin, jawline, around the mouth, and even on the chest and back. A study examining the prevalence of acne in adults over age 20 found that acne affects more than 50 percent of women between the ages of 20-29 and more than 25 percent of women between the ages of 40-49. The study also found that a disproportionate number of adult women were affected by acne compared to similar-aged men. Adult acne is caused by sebum, an oily substance produced by the skin’s sebaceous glands. Sebum clogs pores, which attract bacteria and become inflamed. For some adults, breakouts are a result of hypersensitivity or overproduction of androgens (male hormones). But an imbalance in both male and female hormones (estrogen) can also cause breakouts. For women, this can happen during pregnancy, perimenopause, and menopause. Some medications, such as corticosteroids, and cosmetics can also contribute to the development of acne. Fluctuating hormones. Acne is typically associated with the hormonal swings of puberty, but any time hormones fluctuate, acne can flare. Many women are familiar with the once-a-month breakout. Hormonal swings also occur during pregnancy and menopause, causing acne in some women. Androgens, the male hormones present in both men and women, can contribute to acne flares by over-stimulating the oil glands and altering the development of skin cells that line hair follicles in the skin. Note: The majority of women with acne have normal androgen levels, but hormonal testing is recommended for females who have acne accompanied by excess facial or body hair, deepening voice, or irregular or infrequent menstrual periods to rule out conditions such as Polycystic Ovarian Syndrome. Discontinuing birth control pills. Some women get acne when they stop taking birth control pills. The pills may have been keeping their acne at bay. Taking certain medications. Birth control pills that contain estrogen and progestins often help control acne in women. When a birth control pill contains only progestins, it may make acne worse. Acne is a possible side effect of other medications as well. These include anticonvulsants, corticosteroids, and sobriety drugs. Never stop taking a prescription medication because acne develops or worsens. Talk with the doctor who prescribed the medication. Ask if a different medication can be prescribed that will not cause acne to flare. If only one medication can be prescribed, talk with a dermatologist about ways to control the acne. Do not stop taking the medication. Family history of acne. In one study, researchers found that 50% of the adults with acne had a first-degree relative (parent, sibling, or child) who had acne. This suggests that some people may have a genetic predisposition to acne. Stress. Studies indicate that stress may trigger acne in women. Researchers have found a relationship between increased stress levels and higher levels of acne in women. Those who reported "high" or "very high" stress levels had a threefold greater risk of acne, compared with women who were less stressed. In response to stress, the body produces more androgens (a type of hormone). These hormones stimulate the oil glands and hair follicles in the skin. When over-stimulated such as during times of stress, acne can flare. Products used on hair and skin. Some products such as oily sunscreens and hair greases promote a type of acne called acne cosmetica. When buying products to be used on the skin or hair, look for ones labeled “non-comedogenic” or “non-acnegenic.” This means that they are less likely to cause acne. HOW IS TREATING ADULT ACNE DIFFERENT THAN TREATING TEEN ACNE? Adult acne can be particularly frustrating. Treatments that worked well during adolescence can often be found to be ineffective or overly drying. Many common over-the-counter topical medications designed for oily teenage skin can tend to irritate adult skin, making acne worse. Adult women are more likely to have thinner, drier skin as they get older, and some ingredients such as Benzoyl Peroxide that are found in many teen acne medications may cause more skin irritation in patients with more mature skin. Apply the appropriate amount of ACNEVIR to the skin (enough to cover the affected area with a very thin layer) one-to-three times every day until the acne clears. Using more than is recommended will not produce better results, but may instead cause irritation or dryness. Use non-comedogenic or sensitive skin products in order to reduce the formation of new acne lesions and to minimize skin irritation. Mild cleansers should be used twice a day. Avoid cleansers or other skin care products with scrubbing particles or a gritty texture, as they can irritate the skin. Use a non-comedogenic moisturizer daily. Avoid picking, squeezing, popping or touching acne lesions to minimize trauma to the skin and to help reduce the risk of scarring and secondary bacterial infections. It's not a miracle. It's medicated. Healing is believing. ©2019 Alva-Amco, all rights reserved.